October is also Dysautonomia Awareness Month! Wahoo! 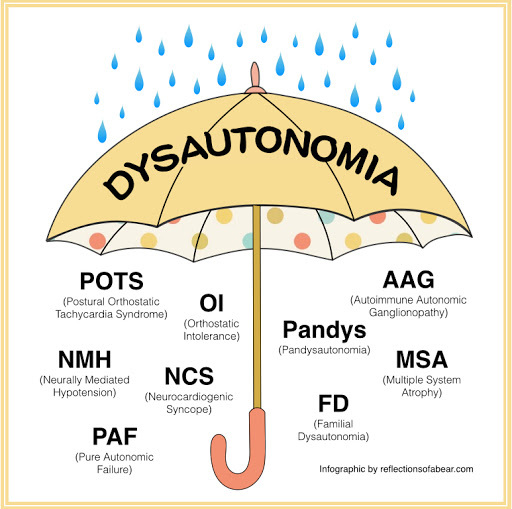 Dysautonomia is an umbrella term for several conditions that result from a dysfunction of the autonomic nervous system (ANS). Many people know of the ANS from health class as being the system that is in charge of the “fight or flight” response, and you’d be mostly right. Yes, the ANS is in charge of “fight or flight” but more broadly, it is essentially in charge of regulating the automatic functions of your body. 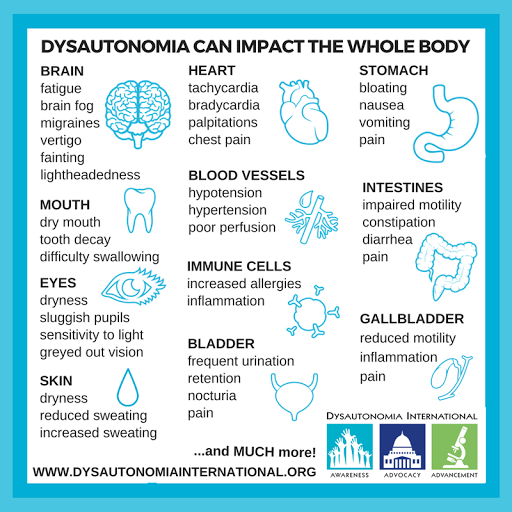 There are nine different types of dysautonomia: POTS, OI, AAG, Pandys, NMH, NCS, PAF, FD, and MSA. Learn more about them here. For this post I will only be talking about POTS and my experiences with POTS. I have secondary hyperadenergic POTS (hPOTS). 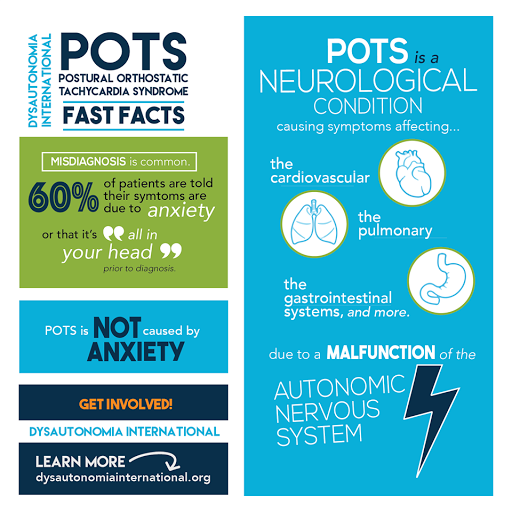 As stated above, POTS is a neurological condition in which the ANS does not send the proper signals to the body to regulate blood pressure and heart rate (primarily, POTS affects the whole body). Normally, when a person stands, gravity pulls blood to the lower extremities. The nervous system senses this and sends a message to the blood vessels to constrict, sending more blood back to the heart and head. With POTS, this message to constrict does not get sent. Therefore, instead of the heart rate increasing by a normal 10 to 15 bpm upon standing, it can increase by more than 30 and can even double (when first diagnosed mine went from 68 bpm lying down to 189 bpm and remained that way for 10+ minutes). By affecting circulation, it also affects cerebral blood flow. Symptoms include orthostatic intolerance (dizziness), chest pain, headaches, GI cramps and dysmotility, inability to focus and concentrate for long periods of time, inability to read due to blurred vision, difficulty with recall, blood pooling, extreme fatigue, nausea, tremulousness, insomnia, loss of consciousness. While there is some knowledge about comorbid conditions that are commonly seen with POTS and certain types of POTS have associated causes with the start of symptoms, it is unknown what is the true cause. For example, one type of POTS can occur post-concussion and we know that but not everyone who gets a concussion gets POTS. There is currently no cure and treatment is based on symptom management. POTS is caused by anxiety. POTS symptoms can mimic anxiety/panic disorders patients are often misdiagnosed or POTS is missed entirely because symptoms are deemed to be caused by anxiety. See research here. POTS is caused by deconditioning. See research here. Exercise (for those allowed by their doctors) can be a crucial part of a POTS patient’s treatment plan but is not caused by deconditioning and cannot be cured by exercise alone. POTS is just getting dizzy sometimes. 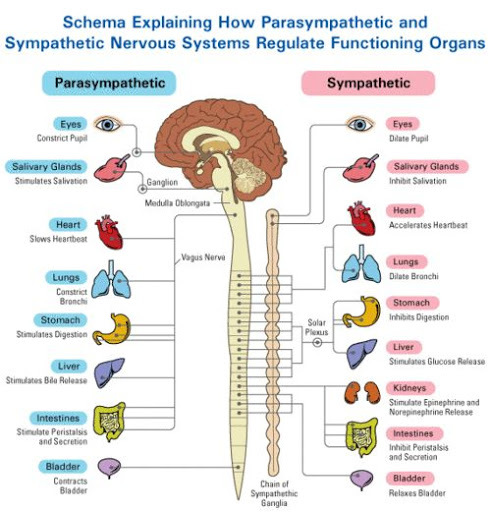 POTS is a complex neurological condition that effects every patient different though almost all, if not all, have multiple organ systems effected. I was formally diagnosed with POTS in 2015 though I had symptoms beginning in early middle school years. To save my fingers I am just going to talk about my current life with POTS and will probably do a more extensive post later, I just tired and lazy. Remember the last time you had the flu and ached everywhere, slept all day and don’t remember half of what happened? Now imagine waking up feeling like that every day (and more! 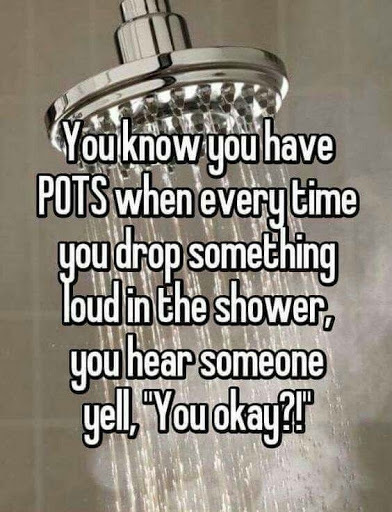 yaaay), this is one of my main struggles with POTS. Several factors contribute the fatigue including medication and adrenaline surges/crashes but on any given day my energy level is equal to or less than a sloth on Ambien. I take naps nearly daily, sometimes multiple times a day just to keep up with my peers. I have trouble filtering out stimuli, recalling things, producing speech, following multistep directions, and reading for comprehension. Another big problem I have is blood pooling. POTS alone can cause bad pooling but with the stretchiness of my veins from EDS, it is much worse. 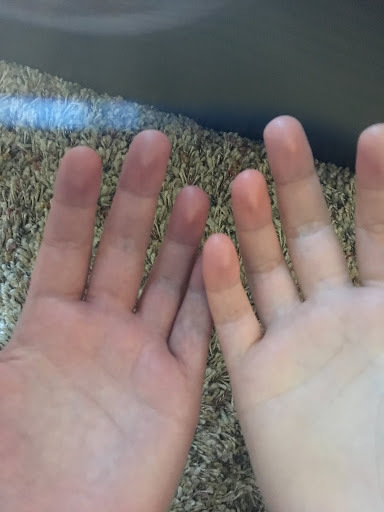 I also have Raynaud’s syndrome so my hands and feet are always cold! The picture to the left is an example of blood pooling in my hands (on medication). This is what happens if I stand with one hand raised and one arm relaxed for two minutes. The white hand was raised and therefore has less pooling (gravity does all the work). After about a minute of sitting my legs look like my left hand. Now imagine a 11 hour car ride or a 3 hour lecture. This is why many POTSies wear compression stockings and socks to help our bodies circulate blood or why lying down with our legs up helps. While POTS impacts many things in my life it does not mean I can’t do fun stuff, learn, and enjoy life I just need everything to slow down and take breaks. I have very limited energy and most is spent on school, existing, medical appointments, personal hygiene (showers are EXHAUSTING), and keeping myself alive. I have to worry about getting places without steps, lying down in the middle of the mall to keep myself from passing out, obsessing over hydration and medication schedules to maintain baseline and prevent things from spiraling out of control, and pretend to be a functioning adult. Thanks for reading and make noise for turquoise (dysautonomia awareness color)! My name is Nate and this post is the first time I have actually seen someone who has the exact symptoms I have with regards to blood pooling in my hands. Every morning when I shave my lower hand actually turns purple while my upper hand remains normal. My feet also turn blue when I sit on any chair or stool that lets my legs dangle. My doctors dismiss this and tell me everything else seems fine so I shouldn’t worry. I also have bouts of fatigue where I can’t even function at work. I have mentioned POTS to my neurologist and she claims it isn’t a recognized disease but only a symptom. She seems to think I have MS or Sarcoidosis but has no answers for the blood pooling. Thank you for your posts as they give me hope that I might one day figure out what the heck is wrong with me. I still hold down a job but it is a daily struggle. I hate to ask, but do you have any advice for me on how to approach my medical team and what steps or actions I can take to get any help? Right now I am just in survival mode living day to day fearing when will my next flare happen. Sorry so long just excited to finally find someone with common symptoms. Thanks for your quick response! I will follow your recommendations and begin to document my symptoms and record my vitals as you suggested. I appreciate the link to Dusautonomia International as well. Thank you for your kindness and I am grateful that I found your site. Very informative. No problem, that is one of the reasons I started this page!